Military doctors must carefully evaluate children for appendicitis to prevent serious harm and death. If a child’s appendix ruptures, it is a life-threatening emergency. 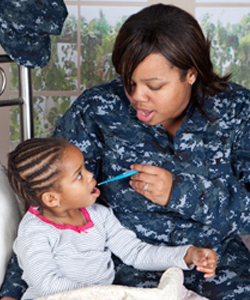 Early diagnosis and surgical treatment can prevent serious complications but military pediatric doctors sometimes mistake the early signs and symptoms of a appendicitis for the flu. We have handled cases involving a delay in diagnosing appendicitis resulting in serious injury and death for children at military hospitals. If your child suffered an injury from delayed diagnosis or treatment of appendicitis due to the negligence of an Army, Air Force or Navy doctor or hospital, we can help you get the compensation you need to care for your child. Please contact us today for a free, confidential, no risk consultation. You may call us toll-free at 1-877-695-8757 (24/7), e-mail us at LawHelp@MilitaryMedicalMalpractice.com or fill out the short form on the right side of this page. There is no fee unless we get a recovery for you.